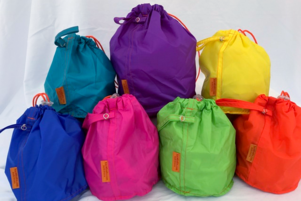 Light weight multiple use pouch made of durable rip stop nylon. Now your knitting can go wherever you do. Attach to your purse, backpack or belt using the outer loop. Attach pouch to car headrest to keep activities organized for children or on the stroller handle for easy access to snacks, toys and beverages. Available in three sizes and twelve colors. Made in the USA. Medium measures 8 x 11"
Large measures 11 x 13"